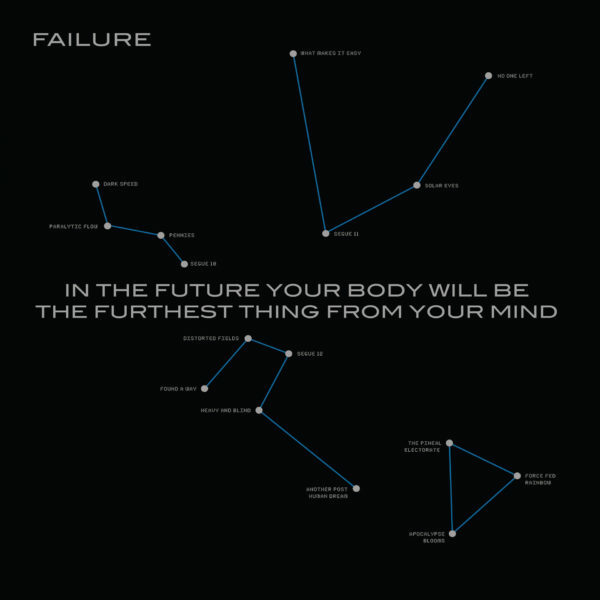 Grunge-rock band, Failure, has announced that their newest album, In The Future Your Body Will Be The Furthest Thing From Your Mind will be released this upcoming weekend on November 16th. Failure is made up of longtime members of the modern alternative rock scene Greg Edwards, Kellii Scott and Ken Andrews. The trio began working under the name Failure in the mid-90s, but differences between them caused the band to break up and each member pursued music differently. Before breaking up, the band had released three full length albums and gained a dedicated fan base. During the early 2000s, the members of Failure went on to pursue various other musical outlets and worked alongside a large number of different musicians. In 2013, however, they announced that Failure was going to be revived and they would begin releasing brand new music. The group followed up on this promise by releasing the album The Heart is a Monster in 2015. That album was met with praise by both old and new fans of the band and showed that this older alternative group could still create albums that appealed to modern audiences. In The Future Your Body Will Be The Furthest Thing From Your Mind is going to be the next full length album released by the group.